Asking me, a man, how to tell if a guy likes you is like getting your hands on the other team’s playbook. I can give you insight into the male mind that the guy you’re interested in wouldn’t ever give you. I’ve talked to a lot of guys about this, and they’re in universal agreement. We just don’t text, call, email, or otherwise message girls we’re not interested in. In fact, unless we’re dating you, the easiest way to get you to go away is to simply stop texting. What you should do to seize this opportunity and get a date with him is to respond when he messages back and make the most of his interest. If you’re not responding, he’s going to assume you’re not interested — and that’s not what you want. When a guy is trying to get one-on-one time with you, it’s a good sign that he’s interested in you. If he’s trying to get one-on-one time with you, that means he wants you. 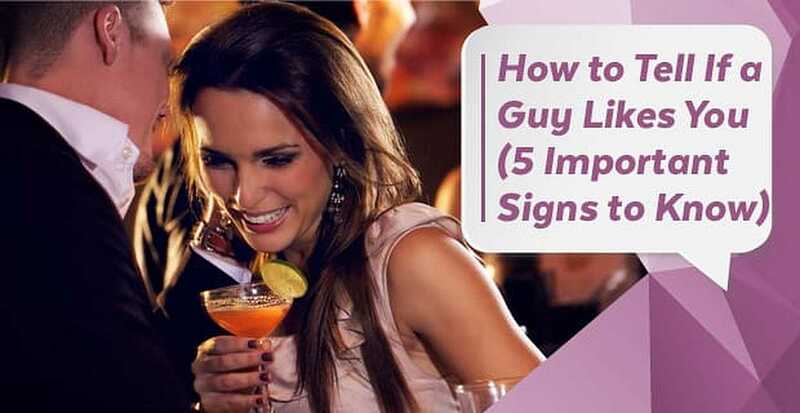 This one-on-one time could be something as detailed as a date or something as simple as trying to bring you off to the side at a party or a club. What you need to do is give him the one-on-one time he’s craving. He’s only going to go try so many times before he gives up. Obviously if a guy is groping you, that can be super creepy and unwanted, but that’s not what I mean. What I mean is he’s touching you in ways that seem innocent or even accidental — like bumping elbows if you’re sitting next to each other or patting your shoulder when you make a joke. Trust me, these gestures might be innocent-ish, but they’re not accidental. If he doesn’t like you, he’s going to give you a wide berth. From a guy’s perspective, I recommend that you touch him back — deliberately and in ways he’s going to notice — if you like him. For the most part, men aren’t dying to listen to you go on about your problems at length (whether you’re doing that in person, on the phone, or over text) unless they’re attracted to you. If he’s there to listen and comfort you when you have a problem, he probably likes you. So if he’s listening to you gripe about your hard day at work or the test you’re studying for with a smile on his face, that means he’s interested in you (and maybe even he secretly loves you) in a profound way. Be careful with venting to him, though. Don’t abuse the privilege and use him as a sounding board every time something is wrong. Guys don’t change much between the ages of 8 and 80. One thing that remains constant is that when we like a girl, we also like to give her a little grief. Why? Who knows, but pigtail-pulling in third grade eventually becomes verbal teasing. It’s not meant to be mean and shouldn’t be perceived that way. He’s just looking for a bit of banter the best way he knows how to get it. Take it in stride and tease him back just as much as he’s teasing you. The thing that women often have trouble understanding is that men are pretty simple creatures. Sometimes women can think we’re complicated, but we’re not. So the simple signs you’re overanalyzing are probably clear signs that he likes you just as much as you like him. Robert Warner is a dating and relationship expert and staff writer with The Art of Charm, a social skills training company. He is based in Los Angeles, and when he's not writing about dating, relationships, love, or other related topics, he loves to drink expensive coffee and cheap beer (but not at the same time). How Do I Know He’s the One for Me?